It is a matter of only few days before the so-called Arab Spring which led to the fall of three autocratic regimes in Tunisia, Egypt, and Libya, faces its first democratic test. Next Sunday (October 23, 2011), Tunisians will head to polls to elect a national constituent assembly which will be responsible for the writing of a new constitution, and forming a new interim government. The elections are much anticipated by Tunisia, as they were delayed by three months , for logistic reasons. As the North-African country is now technically ready for what everyone hopes to be free and fair elections, there are fears that the number of voters to show up on election day might be disappointing. 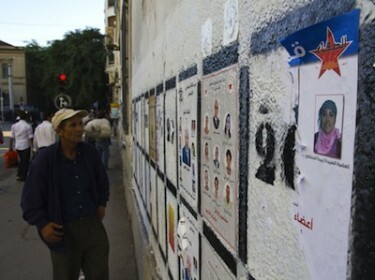 Passerby glances at election posters in central Tunis, Tunisia. Image by Jonathan Mitchell, copyright Demotix (12/10/11). Nadia published a post on her blog called ”Votez ” (Vote) [fr], to encourage her fellow citizens to cast their votes. Only a few days separate us from a historic day. Nothing is guaranteed when it comes to the results of this event, anticipated by many for decades. No one can pretend to know how many Tunisians will go vote, in which conditions will the election take place, and which parties and independent figures will succeed to convince, and which look will the constituent assembly have after the vote. You are Tunisian and you will vote. Non-governmental organisations also joined the voices calling for Tunisians to cast their votes. The following YouTube video, shared by the association Engagement Citoyen features the residents of La Goulette (a city in Tunis), waking up in the morning of October 18 to find out that their city was decorated by a gigantic portrait of former Tunisian President Zeine El Abeidine Ben Ali. Overcome by anger, the residents and passers by took down the portrait and a message saying ”Beware Dictatorship Can Return. On October, 23 Vote” appeared. In my estimate, a turnout of less than 60 percent would be a big disappointment for the country. Less than 50 percent could lead to some major problems concerning the legitimacy of the elections. On the other hand, a turnout of over 70 percent, with wide age, gender and geographical distribution would send the strongest symbol yet that Tunisians will stand for their rights and hold their government to account.